Asian Food Channel (AFC) and Berjaya University College of Hospitality are proud to present a Dinner & Cooking Demo with Chef Bruce Lim, aka The Boss! Chef Bruce Lim, no stranger to me at least, stars in his own AFC Original Production, Tablescapes, where he and his partner Angel, travels through the Philippines exploring and teaching about traditional Filipino cuisine. AFC is now proud to present Chef Bruce’s new food production, The Boss airing currently at AFC’s channel 703! 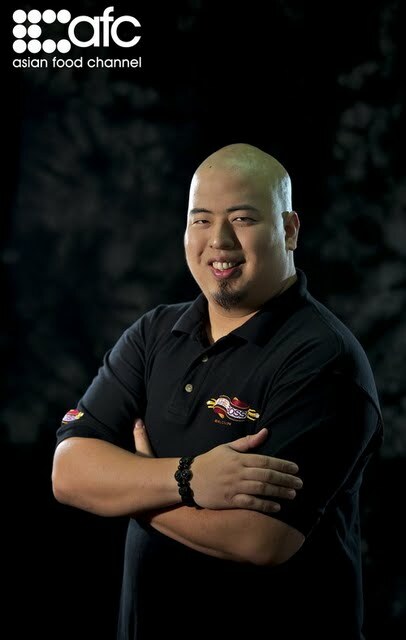 Born and raised in America, Chef Bruce Lim is of Filipino-Chinese descendant. After graduating from Le Cordon Bleu, a top-notch culinary school in London, Chef Bruce worked his way into some of the best French kitchens in the world and even studied under the tutelage of world-renowned chef, Gordon Ramsay. Thereafter, he moved back to the Philippines and worked at popular establishments such as Century Park Sheraton and Jollibee Food Corporation. He then opened his own restaurant named Chef’s Table, an open concept restaurant that allows diners to get up-close and personal with the chefs as they prepare authentic Filipino dishes. Bubbly and conversant in nature, Chef Bruce has distinguished himself from other Filipino chefs by immersing himself in various communities thus removing the elite image of chefs. With him, he brings along the message that food is universal and should be shared by everyone. Although he has a host of specialties from traditional French and Italian cuisines to Euro-Asian and international cuisine, he is also a master of creative food presentation. Chef Bruce also has a thorough knowledge of sugar pulling and chocolate work. I had the honors of attending Chef Bruce Lim’s Cooking Demo and was treated to two recipes of our dinner, Prawn and Mango Salad with Smoked Fish Vinaigrette and Black Rice with Seafood. Chef Bruce showed his professionalism with ease at demonstrating his recipes, answering questions and explaining certain tips of the trade, all these while multitasking on the burner together with his assistant, JC aka Monkey. The salad recipe was fairly simply but the aroma had all of us salivating while the prawns sizzled with delight! We started off our meal with a white Semillon Chardonnay from Lazy Lizard. Nice aroma and fairly fruity and smooth on the taste bud. 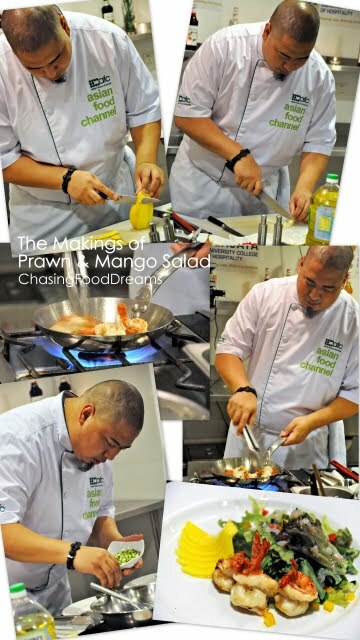 His signature recipe of Prawn and Mango Salad with Smoked Fish Vinaigrette showcases local prawns’ sautéed with garlic and served on a bed of mixed greens with a tinapa vinaigrette while a fan of sliced mango sweetened the dish. Simple but great flavors of sweetness and sourness enhance the prawns brilliantly. Our next dish of Lobster Bisque with Crab Omelet was a rich lobster broth served with a classic 3 fold crab omelet and lobster medallion. The broth was lightly creamy but richly flavored with shellfish while the omelet was decent. As said earlier, I adored this dish of Black Rice with Seafood! The rice was creamy and rich from coconut cream and cooked to al dente. 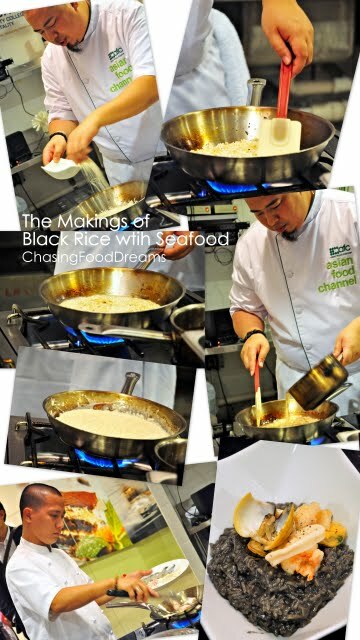 A light scent of squid ink added the flavor while a sprinkling of cheese enhances the rice to another level. Sautéed seafood creates the extra touch to the dish. We proceed with a red wine for the meat course with 2008 Merlot from Firefly, Australia. I thought the red was a bit too sharp but my friend thought it was good enough for him! We ended our lovely dinner with Chocolate Layered Cake where Chef Bruce shared his recipe for a simply moist chocolate cake layered with raspberry jam and topped with chocolate ganache. A quenelle of whipped cream and fresh raspberry finished the dessert! Samplings on the Fourteen produces top quality food and services with head chef, Chef Valmurugan Subramaniam and team. I have enjoyed few dinners there and every one of them was presented with charm and grace from its food to its service! Wellness Recipe, 10 Boulevard: Healthy Organic Food to Rejuvenate thy Inner Self! Let’s face it in this modern day and time, we eat out fairly often! So when I was invited by our dear foodie Yvonne to check out a café that serves healthy and organic food, my first thought were that healthy food would be bland without my essential indulgence of certain ingredients. Oh well… my curiosity was peaked so I decided to give this a go! Wellness… what does it mean? Wikipedia defines this as health or freedom from disease. So when I saw the name of the café was listed as Wellness Recipe, it truly signifies what the café’s concept of food is all about! Located in a fairly new building on a major highway, Wellness Recipe was certainly pleasing to the eye when I walked in. A brightly neon green sign shone brightly at the entrance while the interior of the restaurant was themed in white and green. The whole ambience shouted clean and crisp with splashes of green to naturalize the whole restaurant. I also liked the adorable décor of a fireplace with some cute ornaments! Wellness Recipe also has a Wellness Spa Concept in the same location and one embrace a healthier lifestyle through its food and spa programs. We settled in and were quickly given a glass of BarleyGreen Premium Barley Grass Juice. A briefing by KS, part owner of the restaurant, educated me on Barley Green Premium which is a spray dried powder, juiced from organic young barley leaves that feature a wide range of all natural nutrients to detoxify, balance and nourish our body. The barley grass with kelp can actually improved mental clarity, help with digestion and regulate skin, hair and nails, delay effects of aging and many other health issues. I thought the drink was quite refreshing and had light flavors of the barley grass. Read more about the product at the website. When I saw the tri-color Organic Juicing Noodles, my first thoughts were that these looked almost too pastel pretty to be eaten! The spaghetti noodles are actually made from the Barley Green product powder. Pink denotes BetaBeet, yellow for BetaCarrot while pastel green is derived from BarleyGreen. One can even buy these dried noodles off the shelves for home consumption! We started off with the Organic Juicing Noodles with Yo-Chi Sauce and Mushroom Sauce. Yo-Chi Sauce is the house made red sauce of tomatoes, carrots, celery, onions and other healthy ingredients while the Mushroom sauce is made from several types of mushrooms in a light white sauce. I prefer the Yo-Chi sauce for its vibrant and refreshing flavors of a nice balance of sweet and sour against the soft noodles. Then we were handed bowls of Organic Brown Rice, a healthy combination of complex carb where few types of brown long grain rice are highly rich in fiber and protein. The organic brown rice has a fairly tender texture and tasted not too bad in my opinion. Wellness Signature Chicken was the only meat dish that night. The crispy chicken in a thin batter was coated with a slight sweet and spicy herb sauce. Decent and tasted almost healthy with its lightness (or maybe it was my mind playing tricks on me?). Our next dish of Green Curry faired wonderful with my organic brown rice. Loaded with a kaleidoscope of vegetables like eggplant, lady fingers, young corn, carrot, cauliflower, bell pepper, cabbage, enoki mushrooms and more, the curry was quite light in creaminess as it does not contain coconut milk but rather, were jazzed up with spices to produce a spicy and light curry. I doused the gravy on my rice and happily dug in with glee! We also shared a Korean Style Steam Hotpot featuring a stew of vegetables and bean curd with splashes of black beans. This broth had a light flavor despite the black beans and I found radish, corn, enoki mushroom and other vegetables vying for attention together with pieces of soft bean curd. I preferred the curry over this stew. When I saw Wellness Lei Cha on the menu, I was quite excited as I love Lei Cha for its unique flavors and ingredients. The Wellness Lei Cha is delicious as it had a truly unique vegetable ingredient like purple cabbage, green veggies, black eye peas, nuts and sesame seeds. The accompanied soup was also beautiful and tasted of the essential Lei Cha herbs. I consumed my Lei Cha with the soup on the side rather than together to enjoy the fragrance of the rice with the vegetables. Lei Cha lovers, do check this out! Desserts came in the form of a surprising Vegetarian Rojak! We were assured that the version here is healthy and does not use the usual shrimp paste. Piled high with pieces of fresh fruits and vegetables, the rojak sauce is quite thick and the chopped nuts and sesame seeds added a nutty taste to the salad. Quite decent considering it’s a vegetarian version. We polished of our final dessert of warm Wintermelon Longan Tong Shui. The sweet broth was not sweet at all and faired decent in flavors. After savoring the dishes of Wellness Recipe, I find my verdict quite surprising! I learned that healthy food can taste quite good and there is quite a sense of warmth to the dishes here at the café. I was also glad that I do not feel heavy after the meal as I usually do with some other meals. Portion wise are decent and prices faired decent too considering organic ingredients are quite expensive. Price range for single portion meals is less than RM20 and below. Menu is limited but the café features specials of the day where the chef cooks up whatever is freshly available on that day. Yes, flavors are definitely lighter but that why the dishes are healthier as it is not overloaded with artificial flavors or heavily season with salt and sugar. Intermingling the cuisine of Albanian, Italian and Mediterranean cuisine, Porto Romano reigns into a luscious melting pot of rustic and bona fide dishes to please even the finicky food connoisseurs! 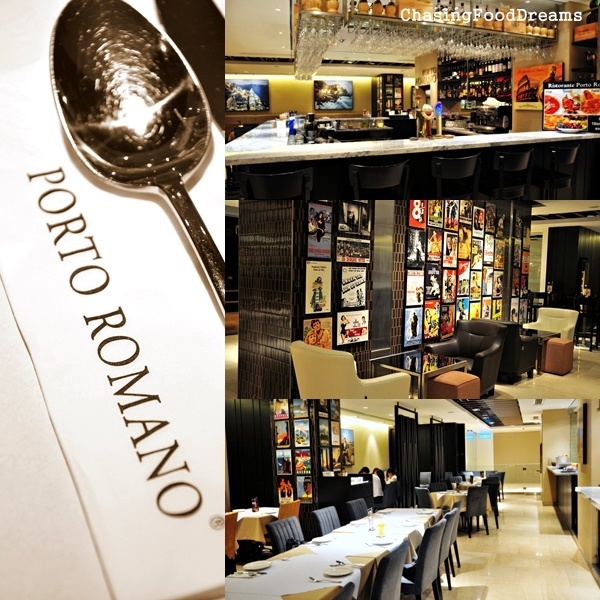 The latest addition to the Porto Romano restaurant group is located at The Intermark, Kuala Lumpur. Ristorante Porto Romano is the brainchild of Eddie and Sonila Wong, a dynamic husband and wife team who dreams of showcasing some of the best dishes from the Mediterranean shores. The restaurant is already famous in the city since a few years ago and is still proudly sharing a plethora of scrumptious dishes today. The whole ambience is decorated with combination of a classic theme of light and dark furniture with a wall showcasing memorabilia of classic movies from the past! There is a gorgeous marble bar that featured a lovely range of wines and decked with state-of-the-art coffee machine. Private dining rooms are also available at this outlet for private functions. I spied an open concept kitchen discreet tucked in the corner of the restaurant. We started off with some Fruit Juices and beautiful Canepa wine selections of Chardonnay and Carbernet Sauvignon while someone opted for a pint of Kilkenny beer! Canepa Wines features Chilean wines inspired from Italian soul. Our classic Chardonnay 2009 was fruity and very smooth on the palate while the red Carbernet Sauvignon 2010 had a straight and almost velvety taste with a hint of chocolate undertone. Spicy fans, take note and request for a bottle of the house made Chili Sauce! Awesomely spicy!! Our journey of the Mediterranean cuisine begins with a very rustic Grilled Vegetables (RM28) featuring a rainbow of grilled bell peppers, aubergines and zucchini, simply dressed with garlic, balsamic vinegar and EVOO (extra virgin olive oil). Smoky and pungent from garlic, the vegetable slices were addictively beautiful with a hint of sourness. Famed for salads, Mediterranean salads tend to focus on seafood from the abundance available due to geographic location. Porto Romano Salad (RM24) displayed an array of fresh seafood such as prawn, clam, squid and mussels all vying for attention in a light dressing of herbs, lemon juice and EVOO. Bold in showcasing fresh seafood flavors and further enhanced in a huge seashell bowl! Soups are crucial in the three countries and Porto Romano proudly produced fairly big options of soups in their menu. Out of the seven choices, we sampled three with one being Porto Romano Seafood Soup (RM24). This one guarantees to please with its overloaded array of fresh seafood cooked in a tomato based broth. Hints of herbs complete the soup lusciously! Prawn Bisque (RM16) has a thick and velvety texture with a base of prawn flavors melded with a swirl of cream. After stuffing ourselves with soup, we proceeded to pastas for our carb devotion. I really cannot decide which of the pasta I like better and concurred that both were equally fabulous on its own. Squid Ink Pasta (RM35) had jet black thick strips of fettuccine cooked al dente and accompanied by fresh squid to enhance the flavors. Great control of seasoning and flavors as the pasta flavors were savory and clean with hints fresh squids making this even more delectable. Delicious!! I also adored the Spaghetti Puttanesca (RM27) as the flavors were beautiful from the essence of tomatoes, capers, olives and anchovies. Tender pieces of aubergines went surprisingly well with the pasta as it absorbs the tomato sauce beautifully. Customers are definitely spoilt for choice with a list of 18 pastas ranging from the brave Penne al Gorgonzola to the classic Spaghetti con Aglio e Olio! Our next carb dedication led me to Porto Romano’s rustic pizzas! Pizza al Toro (RM35) is a haven of beefy goodness. The fairly thin crust pizza is laden with strips of beef pepperoni, beef bacon, beef pastrami and held together by a sea of melting cheese. A light tomato sauce jazzed up the pizza while a sprinkling of herbs aromatized the pizza… a Porto Romano Original! Porto Romano’s signature pizza, Pizza Pesto & Chicken (RM45) is concocted by Sonila herself! Tomato sauce makes way for a nutty and herb pesto sauce while lean thin chicken strips lay down the protein for the pizza. I like how the pizza tasted of herbs and cheese in its original form as this really makes the pizza truly unique and delicious in its own way. Char-Broiled Chicken Leg Spanish Style (RM32) may sound unconsciously normal but flavors exceed my expectation. The chicken was so juicy and tender, a sign of perfect timing of doneness, while the slightly citrusy sauce of lemon really brings out the sweetness of the moist chicken. A medley of roasted potatoes and bell peppers finished the dish beautifully in a comforting manner. I really enjoyed this dish a lot!! Moussaka (RM38) is an infamous Greek classic version of lasagna. As my sister’s mother-in-law was of Greek descendant, I was introduced to this dish a long time ago and have fallen hopelessly in love with moussaka (btw, my sis makes a mean moussaka)! I like risotto when it’s done just right so Risotto Fruitti di Mare (RM32) passed with flying colors at this restaurant. Italian Arborio short grain rice cooked al dente interplay with an array of fresh seafood was definitely cooked to perfect consistency. The silky risotto was creamy and flavored well with white wine and sweetness of seafood, thus I happily dug into this dish with great gusto. I would definitely order this dish again. Our last main dish ended with a glorious sight of Braised Lamb Shank (RM38). Simply the size of my hand, the huge lamb shank was slowly braised in oven for hours till just tender and was coated with a silky tomato based sauce lovingly. The meat was so flavorful and the savory flavors exuded the hours of cooking with accompanied vegetables. A side salad or spaghetti comes with this dish although I would have also gladly enjoyed this with rice as well. Another Porto Romano original recipe! No matter how much I enjoyed each meal, I detest the ending, especially when a meal is so awesome! My only consolation is to end my meal with desserts… J We savored two desserts and coffee that night. Torta di Mele-Apple Pie (RM 12) is classic take on warm apple pie with ice cream. The apple pie is wrapped like a parcel with phyllo pastry instead of the usual short crust and has a filling of apple chunks dusted with all sorts of spice mix like cinnamon and nutmeg. My only gripe was the spices were a bit too heavy for my liking as it overshadowed the apples. No faults on ice cream as it was indeed very creamy and yummy. Affogato, a sinful interplay of a scoop of vanilla ice cream or gelato and a shot of hot espresso, optionally doused with another shot of liqueur is a brilliant creation believed to be created by the Italians. Porto Romano’s Affogato is beautifully made with love and a shot of Kahlua liqueur for that extra loving touch! Porto Romano features Caffe Vergnano from Italy from the Vergnano family and has a history dated all the way back to 1882. The coffee beans are slow roasted for an even quality with maximum flavor and aroma. Coffee lovers… get your fix here! *There is also two other outlets at Taman Tun Ismail and Mont Kiara. **Thanks to Eddie, Sonila and Sid for the lovely evening! Zuan Yuan, One World Hotel: A Teochew Date!